Greece has been in the news a great deal recently with its precarious financial situation and the European Union on shaky ground. With a government heavily burdened by debt, massive bank bailouts, austerity measures and rioting in the streets, what can one possibly do to make a difference? 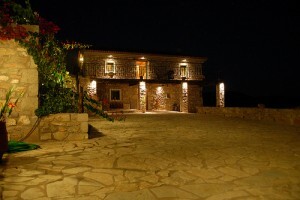 In the heart of ancient Greece on the Peloponnese peninsula, a centuries-old stone farmhouse has been restored in a beautiful valley near Argos, one of the oldest cities in Europe. About two hours journey from Athens by car, one steps out into the air of the Artemesian mountains surrounded by olive trees. Adjacent to the house, its threshing circle or aloni, has been transformed into an outdoor stage by gifted stone masons following their centuries-old trade. Dedicated as a center for cultural exchange by Steve and Dianne de Laet from California, the programs sponsored at their Greek home ElaGaia through their Arete Fund, shine a bright light on places historically important to art and sport in Greece. ElaGaia, the name of their home, celebrates mother earth in this ancient land that has given birth to so many of our collective myths. Perseus the Gorgon slayer was said to have lived close by and one can see Agamemnon sleeping in the outline of the mountains near Mycenae. Greece has always had a strong pull for the deLaets. They were married at a young age on the neighboring island of Spetses, where they had gone for a year to run a sailboat chartering business. 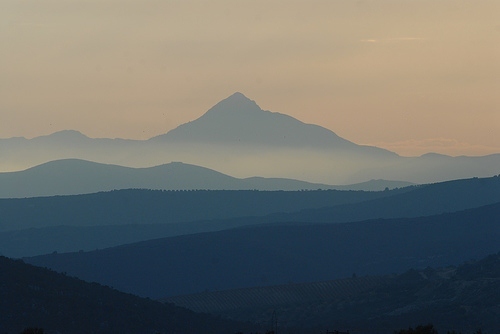 Dianne de Laet in particular has always felt that Greece was her spiritual homeland. As a child, she loved the stories of the Greek myths. She ran her first marathon in Greece on the same grueling route first run by a soldier from the ancient town of Marathon. 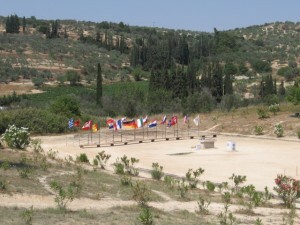 At the invitation of the Revival of the Nemean Games in 2004, Dianne first performed victory odes for modern athletes running in a re-creation of the ancient race as part of the cultural programming held in collaboration with the Greek Olympics. At the Nemean stadium, she collaborated with Greek composer and musician Yannis Iordanaglou. In 2005, she performed with Yannis in his hometown of Argos. 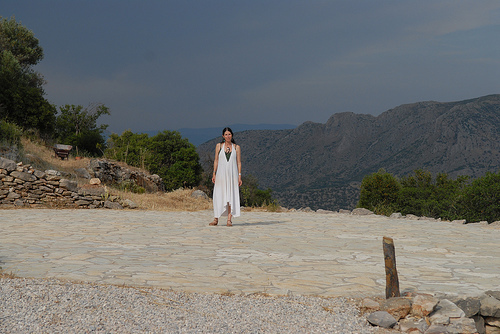 It was a fateful trip for there she and her husband found the site with the abandoned farm-house which they have transformed into their home, now also a cultural center and artist’s retreat in Greece. Dianne is a best-selling author, harpist and poet. She is also a praise-singer who embodies the spirit of the poets of ancient Greece who sang victory odes to the athletes for their accomplishments. Her first book is an ode to her father Y.A. Tittle. “Giants & Heroes: A Daughter’s Memories of Y.A. Tittle“, does much to celebrate the Greek word for Arete, or “excellence of striving” that her father modeled as a star quarterback for the New York Giants and the San Francisco 49ers. Proceeds from the book helped establish the nonprofit Arete Fund which gives entry-level college scholarships to seniors who show excellence in either art or sport and need support to reach their educational goals. The Arete Fund also assists with humanitarian projects and cultural programing in a variety of countries throughout the world. On June 23-24, 2012, the de Laets have invited their friends and neighbors in the U.S. and Greece for an incredible weekend of art and sport. 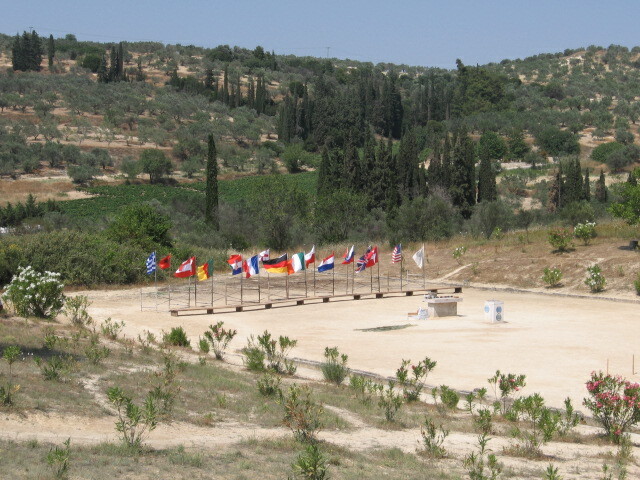 The Fifth Nemead , or re-creation of the Olympic games, is now held every four years in the ancient stadium at Nemea under the guidance of U.C. Berkeley Professor Stephen Miller and with the help of many others. Over a thousand athletes from a hundred countries in the world will travel to Greece this year to run the course barefoot and to be crowned in olive branches at the finish line as they were in ancient times. On the day after the race, the Arete Fund will host a cultural exchange of music and poetry at ElaGaia. Yannis Iordanoglou will play original “earth music” inspired by the Artemesian. A San Francisco Bay Area dancer, Marie Soderland will present her “Dance of the Mother’s Tears” to highlight the theme of peace that underlies the ancient games. The Arete Fund hopes all will celebrate shared humanity and remember those whose lives have been lost in the religious conflicts of our time. This year’s program will benefit young Afghani women who have had their human rights violated and are in need of support for their education. I was lucky enough to be invited to take part in the inaugural event at ElaGaia four years ago. I sang along with some musician friends from the San Francisco Bay Area, guitarist Bruce Victor and singer-songwriter/guitarist Stevie Coyle, in an ad hoc group called “The Sirens of San Francisco.” We performed Americana music in collaboration with guitarist/singer Steve de Laet and Yannis Iordanaglou on the aloni in the evening as part of a cultural presentation that included other artists from California and Greece. Though sound and lights were powered by generator on the night of our concert, as the music progressed on the aloni we could feel the presence of the dramatic mountain valley in the darkness. Just as a full moon rose at midnight over the Artemesians behind us, we found ourselves playing Peter Rowan‘s Midnight Moonlight. 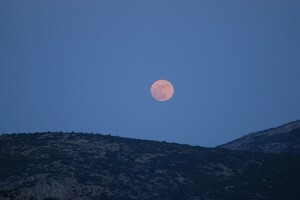 “Look, the moon…” said our Greek friends in the outdoor amphitheater, a sign from the universe that somehow we had made a connection. Later in the evening, our audience serenaded us with their own well-known Greek songs in an emotionally cathartic way. Even though we could not understand the words, we received an idea of the meaning of the songs from the spirited feeling in which they were sung. Many strong impressions remain, especially from the fellowship that grew out of the wonderful dinners in the outdoor tavernas in the nearby charming Venetian port city of Nauplion where many of us stayed. 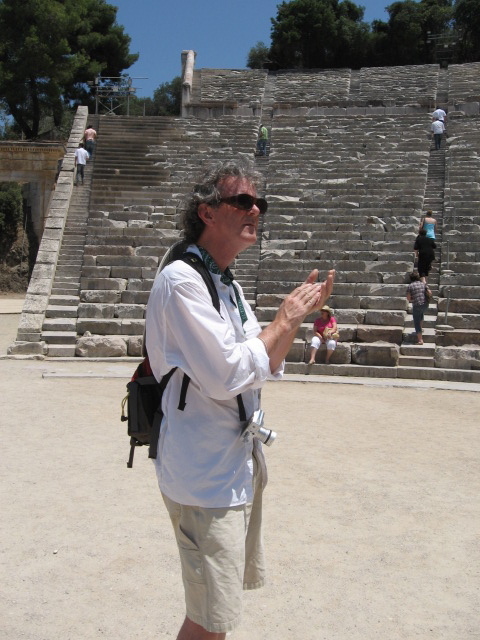 At our field trips to various architectural sites in the area, we learned of the importance of music and healing to the ancient Greeks. At Asklepios, one of the earliest centers of holistic health, we discovered that the musicians were called in to uplift the spirits of the patients for an early palliative treatment before the attending physicians made their rounds. During a side-trip to Epidaurus, we also had the chance to test out the amazing natural acoustics in the ancient amphitheater and to marvel at the way it was designed. 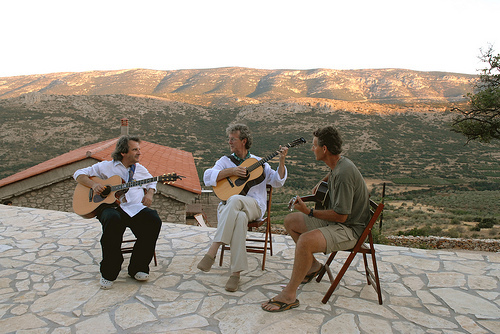 To be able to witness an ancient sport through its re-creation and to share cultures through musical exchange is an extraordinary way to experience the Peloponnese. The ancient Greeks celebrated both art and sport in their communal lives. 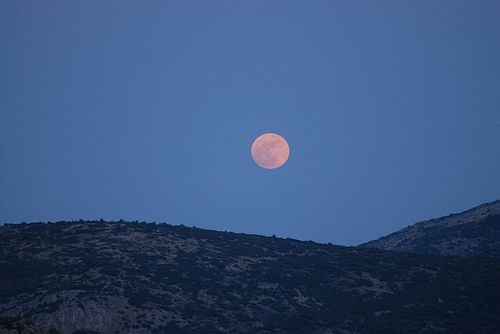 Someday I hope to have another chance to return to Greece. As I traveler, I know I will be asked to go beyond my boundaries to find a sense of arete or excellence of spirit. And in my traveler’s quest to illuminate another culture, my journey will be aligned with the ancient Greeks in a timeless way. Cultural Journey: For more information about this year’s cultural exchange visit ElaGaia or The Arete Fund. For more information about the Fifth Nemead, visit the Nemean Games. Visitors can be based in the beautiful Venetian port city of Nauplion, just 20 minutes away from ElaGaia in the mountain valley outside of Argos. A week-long guitar immersion music retreat will also be offered by guitarist Rick Vandivier at ElaGaia in May of 2013. Support cultural exchange programs whenever and where-ever you can! Email marian@marianhubler.com for future blog posts. I simply want to tell you that I’m newbie to weblog and certainly savored you’re blog site. Almost certainly I’m going to bookmark your website . You definitely come with wonderful stories. Regards for revealing your blog. Awesome info and entertainingly written. Keep up the wonderful stuff! Real fantastic information can be found on this blog. Really superb info can be found on this site. Hi Marian: Totally enjoyed this fascinating post and the photos as well! Bravo! Would love to visit this amazing place. Thanks. Excellent job Marian! I’m very impressed as I come from this part of the world, to be exact, Mycene, Argos, Greece. I visit every year and I love it! !